As racers we work long days and late nights throughout the year for this dream. Countless hours and dollars are invested, time with friends and family compromised, and all for the thrill of the ride. There is a great feeling that comes when it all pays off. Along with great sadness when the car defeats us. We never want to be defeated so we get back up and take strides to better our programs. As racers we are always more positive than negative, yea I know it’s hard to be positive with a 80% chance of rain in the forecast but we are still positive because we still want to go racing. But what I am getting at is, we never think of the bad. You know the real bad, the accidents that are rare but can happen. We will go to 20-30 races a year and see a handful of accidents but again they do happen. As a young racer, my parents always instilled in me to wear all my safety equipment in my junior dragster. When I moved up to a big car, I was used to wearing gloves and a neck collar so I continued to wear that stuff. It even felt weird to me to even press a transbrake button without gloves on. This past weekend, after working all Spring Break while I was off work, I took the 1968 Camaro I drive in Super Street to Thunder Valley Raceway Park in Noble, Oklahoma to test for the season. I grew up racing with Nick Duty, Larry Croft, and the whole management team that is now at Thunder Valley. I knew the surface would be prepped well and we would be given the best facility to test. Before I go into the testing and that day, I want to give you some history on the Camaro. I am not too sure of the history of the car before 2007, besides that it came from the San Antonio, Texas area. Racing friends Bryan & Leo Mendez purchased the car for Bryan to race in conjunction with Bryan’s 1969 Camaro. I drove the car multiple times when the Mendez family owned the car, and we tried to buy it from them from the first race. Anyone that knows Leo, knows it is hard to buy something from him. After a short time, Leo said he would sell the car in 2008. As an eager 18 year old I was excited, but the car was out of my price range at the time. Each year, more often at the beginning and dwindling down over time, I would call Leo to try and buy the car. The price never changed. In 2013, I called him one last time and price was still too much for me, so I called it quits. I waited over 2 years until the next call. In 2015 looking through old photos from the Nick & Larry Era of Northstar Dragway, I saw pictures of me driving the car. So I picked up the phone and called Leo. The car was complete but had been sitting under a cover on jack stands since the last time I parked it in his shop in 2008. Dad, Mike Shabareck, and myself brought it home, unloaded it, changed the oil and carburetor, filled it with fuel and it fired right up on the first hit. We then ran into a problem and found out the block was cracked, Scoggin-Dickey Parts Center was able to get us a factory replacement block for the GM 502 crate motor. The car was back race ready after a few months in the garage. I debuted it in early 2016, winning the first race I took it to in 7.0 index. The car was fun to drive but was far from consistent. In 2016 I attempted Super Street in the car at multiple tracks, with terrible results. I entered the car into Super Street at the Dallas National, without telling dad. He was mad and told me I was stupid. Some would agree, after my time trials I would have agreed too. Knocking of a 10.33 & 11.05 in time trials. But racing is 90% luck and 10% skill. I had luck on my side that weekend and ended up taking home the win in Super Street. The car had proven itself and I took it home and pulled it apart to try and make it better. The 2017 season was less than stellar and I struggled to be competitive like I wanted to. The car was parked for most of the season besides some 7.0 index races and bracket racing. Many more changes came between the 2017 & 2018 seasons. In 2018, I qualified for the Moser Shootout and the car performed well, I ended up with a semi finalist finish in that event. The car was still not the best so I parked it for Super Street competition and focused on Super Comp. The Camaro came out a few times and I just drove bad and had horrible luck in it. I made changes throughout the year, and took it to Big Country Raceway on Thanksgiving of 2018. I was overly aggressive on day 1 and turned it red in round 2. On day 2, I drove aggressive and trusted the car. That lead me to a runner up finish in the main event. I felt good with the setup but not 100% confident in it. That is when more changes came, as you can see I cannot not change something on this thing. With a new heart from SDPC Raceshop, that made great power for the combo, we were off to make life changing strides to the car. Wiseco Pistons paired with Callies Ultra Rods and Crankshaft in the original Chevrolet Performance block with Brodix heads topped with an APD Max Speed Carburetor, the engine looked to be a great reliable workhorse. Bolted to a Sullivan transmission and a FTI converter, the car was ready. Picking up around 300 hp from the original combo, I updated the suspension on all four corners with Penske Shocks. Smith Racecraft hooked up with some new parts as well. Many late nights and trips to Summit made the car race ready. The first run down the track at Thunder Valley was great. The Racepak data looked good, some small adjustments were needed. The second run was just like the first, and lit up the scoreboard 10.70 and 138 MPH. Not too bad for a 3460lb all steel, small tire radial Camaro. I was extremely happy and excited to get closer to 10.90 and have my data ready for the year. On run 3, my luck changed. A few cars in front of me a car had a transmission line leaking. The car did not smoke or show visual signs of leaking. I made my run down the right lane and at 1000’ the car started to get loose. I then let off the gas and that’s when it went from bad to worse. The car turned left and started sliding sideways. I crossed the finish line sideways in my lane. The car contacted the left guard wall about 250-300 feet past the finish line. The car spun around and rolled on to the roof and hood and then back over. The driver side of the car contacted the Armco guardrail at the first turn off which then pitched the car back onto the race surface and it came to a stop. The driver door would not open and window would not roll down. I climbed out of the now shattered passenger window. As I came out of the car, the starter was already there helping me out of the car and making sure power was off. I was checked out by the EMT and Ron Gibson brought his flatbed down for us to load the car up. Thanks to other racers, especially Ron and Pat Gibson, we were able to load the car. The whole time I looked at the car, I was devastated. I was not physically hurt but more emotionally destroyed. The car was making positive strides to being competitive. I was able to walk away from the crash because of the safety equipment and a well built cage. The car is now in the shop on jack stands and we will begin the deconstruction. Currently it looks to be out of range for us to rebuild the car but, that will be analyzed more as we pull it apart. The future of the Camaro is uncertain at this time but you never know what will happen. This car has been a part of the family longer than most cars, it was almost sold at one time. Thankfully it did not leave. It has caused many headaches and has been upgraded many times. I can not thank my parents enough for allowing to race and always helping me. A special thank you to my girlfriend, Keisha Moline, for everything, she has been through it all with this car. I have many people that helped methroughout with this car. Plus many others that I know I am forgetting. Remember to always be safe and wear the proper stuff. You know what you should wear…. It can happen to you. About the Author: Chase Huffman currently competes in his Super Comp dragster and Super Street Camaro. Having grown up around racing, Chase climbed into a junior dragster at the age of eight. At sixteen, Chase moved into the big cars eventually winning the NHRA Fall Nationals in Dallas. On most weekends, you’ll find Chase at the track with family and friends. You can connect with Chase on Facebook @chasendad or email at Chase@dragchamp.com. 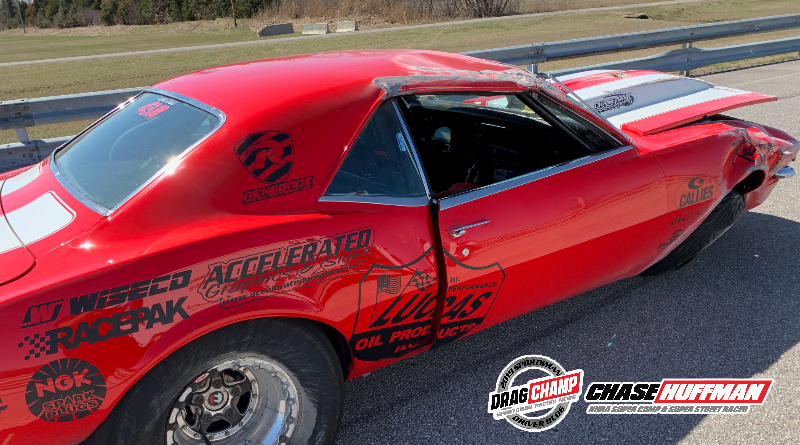 To read more DragChamp racer blogs, click here.